Coverage of Women on SFF Blogs turns three this year. In the last two years we've learned a lot about collecting data, analyzing data, and asking ourselves questions about what the data is saying, if anything. In 2012, we used snowball sampling for the 2011 data. In 2013, the 2012 data was collected via randomization in order to improve our process. This year we used the same method of randomization as we did in 2013, pulling together a master list of SF blogs through robust searches and a submission process that was open for several months. We pulled two sets of 25 numbers from the list (removing duplicates when necessary) from random.org. We pulled 25 blogs from the sampling frame using the first set of numbers. In the cases where the blog turned out to be subsequently closed before compilation, newly inactive since the list was compiled, comprised of SF/F content but not prose book reviews, or inaccessible due to technical issues, we substituted a number from the second list. This was done to prevent us from choosing a blog ourselves if we ran into problems with the initial 25 blogs: instead, we would have another truly random selection drawn from the sampling frame. A total of eight blogs were substituted. Prose science fiction and fantasy fiction material in all related marketing categories only. Fantastical horror (demons, magic, ghosts, etc.) is included, but psychological horror (torture, gore, etc.) is excluded. Horror listings may contain mistakes or oversights due to the fluid nature of this genre. Comics and graphic novels are excluded as artist inclusion is too complicated and time-consuming for us at this time. Young Adult work is included, but other marketing categories for children are excluded. Anthologies are included by contributing authors. Writers under a public, shared pseudonym are counted individually. Guest posts from those who were not regular contributors to a blog were not included. 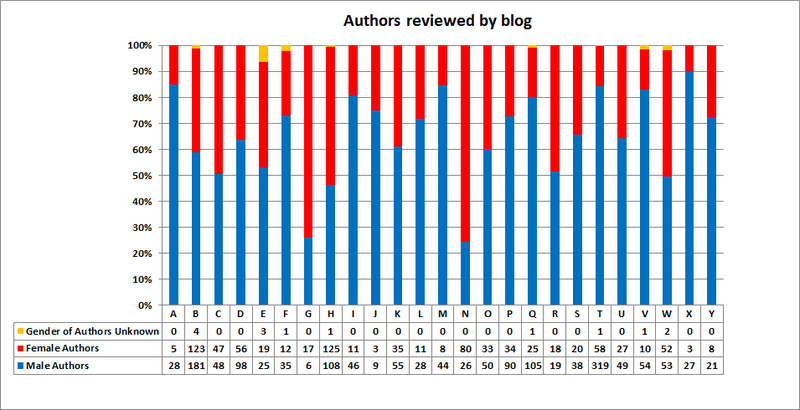 Authors can be counted multiple times if reviewed at different times in different entries. 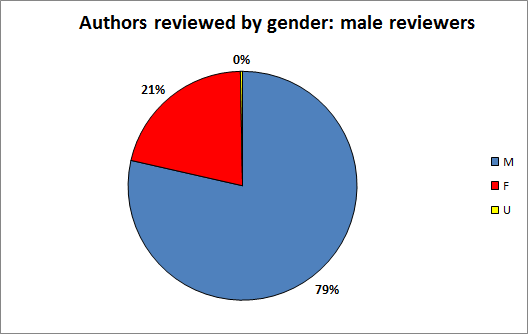 Project thesis: when looking at a sample of bloggers reviewing SF/F, a majority of men will skew toward reviewing more men. A majority of women will skew toward a more equal gender parity, or the opposite in which they review a majority of women. There will be a handful of outliers. 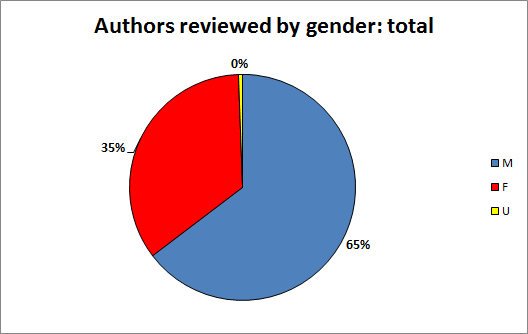 Our data for this year doesn't support our thesis quite as strongly as in previous years, but the data still shows that unfortunately, women writers are not being reviewed at the same rate as men. All 2013 data is available in the project spreadsheet. As always, we encourage anyone interested to replicate our work and share their findings with us. When this project began, the conversation about gender in the genre community was vastly different. In the years since, the discussion has grown considerably, and we're very happy that we were a small part of the ongoing dialogue about gender. However, because the community has changed so drastically since this project's inception this will be the last iteration using these specific methods. We're incredibly touched by all the support the genre community has given us throughout the life of this project. Thank you all very much! Comments are welcome here, or you can direct inquiries to thisisladybusiness@gmail.com. Please follow our comment policy. You can link to and quote from this post without asking, however, please do not reproduce the post elsewhere without our permission. 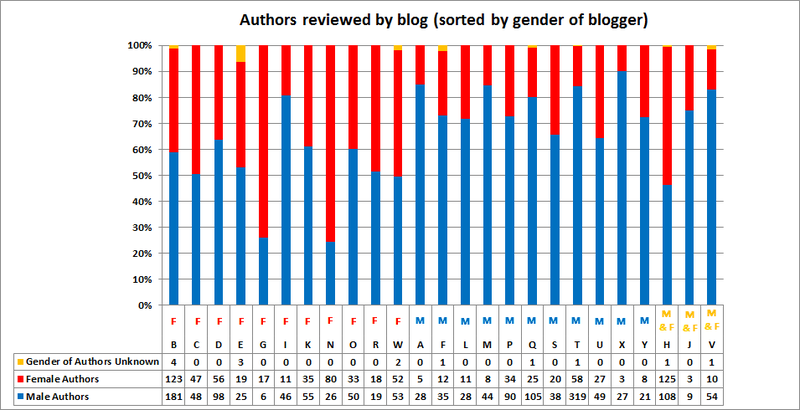 You can link directly to the data portion of this post with http://ladybusiness.dreamwidth.org/2014/06/11/coverage-of-women-on-sff-blogs-2013.html#data", retweet it via this tweet, or reblog it on tumblr. How to Suppress Women's Writing: "GLOTOLOG, n., colloq. Intergalactic, current: Information control without direct censorship." 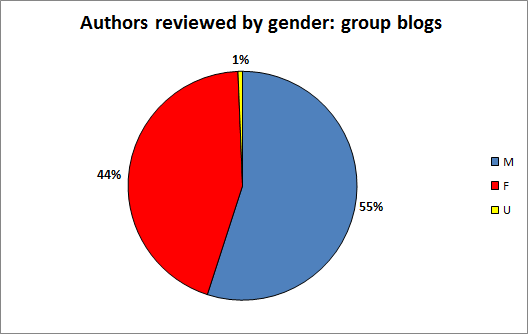 Coverage of Women on SF/F Blogs (2011): "But reviewing and talking about titles on public blogs and journals is an active decision that we're making every time we put a book down and go, 'I'm going to write 1000 words about that and share it with the Internet!'" Coverage of Women on SF/F Blogs (2012): "If you feel defensive when gender parity is a topic, instead of lashing out to defend your reading choices, ask yourself why you feel that way and what you're actually defending and whether it's real, or just a mirage created by the privileges surrounding you." VIDA Count 2012: Mic Check, Redux: "Improvements will happen with effort, not accidentally or by ignoring the glaring disparities." The VIDA Count 2013: "Change happens because individuals make it happen." 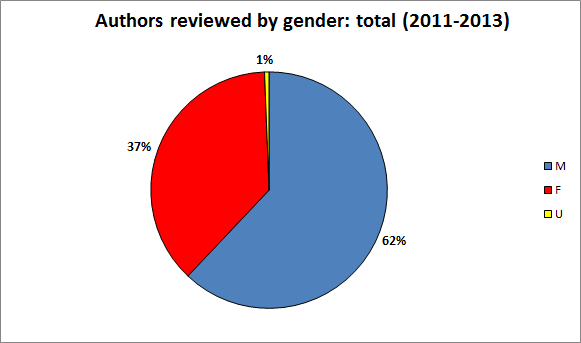 The 2013 SF Count: "As in previous years, in the majority of the SF review venues surveyed, disproportionately few books by women were reviewed, and disproportionately few reviews by women were published."